Democratic National Convention week opened with a first: An Interfaith gathering, hosted by Christian, Muslim and Jewish community leaders from around the the United States. The gathering focused mostly on abortion and capital punishment, less on world poverty and Darfur genocide, and even less on climate change. Why would the self-titled “Greenest convention in history,” hosted by a party so determined to move the climate crisis to the heart of political discourse, open with religious leaders all but ignoring climate change? Obama himself has said that climate change needs to enter the focus of religious dialogue. “It is a responsibility to ensure that this planet remains clean and safe and livable for our children, and for all of God’s children,” he said. Wouldn’t religious leaders representing his party agree? They could have pointed out Republican environmental and energy policies/lack of policies that have left us with a world in neglect- populations facing starvation, drought, desertization, the aftermath of Katrina and a reliance on fossil fuels that promises more war and economic instability. They could have mentioned ignoring Kyoto, disinformation campaigns on global warming, blood ties with petroleum-laden kingdoms and a lack of investment in renewable energy. If we, as faith-communities claim it our job to care for the world, then we cannot support a platform that is so against the heart of what we stand for. Republicans can hold themselves on some distorted religious pedestal, praising themselves for saving otherwise aborted babies- but when millions of already born people stand threatened because of their policy of neglect, who cares? John McCain might be different. I pray that he would be. And I hope that this week’s Republican convention will include religious leaders telling Republican politicians that the way they’ve been is just not okay. As Obama himself says, we need our religious beliefs to effectively confront climate change. 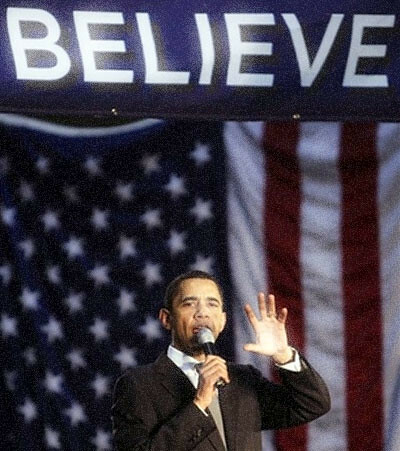 Belief gives us, to use an Obama-ism, the audacity to hope; to believe not only that we should be better, but that we can be better. Religion is not only about faith in God, but faith in man. A focus on climate change could have provided fuel and inspiration to the greenest convention in history. As religious people, we have been talking about stewardship in theory for thousands of years and it is time for us to step up. “Take care not to destroy my world,” God tells Adam (Ecclesiastes Rabba 7:28). Well we risk a lot more right now than getting kicked out of some garden and it doesn’t look to me like we’ve got our eye on the ball. Truth is though, that we’re religious people- We thrive on learning from mistakes. Our scriptures show History dabbling in ultimate disaster, but in the end promise peace. Jewish tradition claims that those who “Do better next time” are on a higher level than those that never did wrong at all.